Preparation and application of CoMgAl-hydrotalcites have been studied. In this paper CoMgAl-LDHs photocatalysts were prepared by co-precipitation. Various techniques such as UV–visible spectrometry (UV–vis), BET, differential thermal gravimetric analysis, scanning electron microscopy analysis and X-ray diffraction were used to investigate the catalytic activity, structure, and composition of the prepared samples. The photocatalysts were developed as layered double hydroxides (LDHs) due to their layered structure with OH−. In the paper, specific surface area, thermal stability, absorption of visible light, and layered structure (crystal phase) were characterized by nitrogen adsorption–desorption method, differential thermal gravimetric analysis, UV–vis methods and X-rays diffraction. The results indicated that CoMgAl-LDHs caused photocatalytic degradation of methyl orange, rhodamine talcum, and methylene blue. Initially 1 g/L of the photocatalyst was used to degrade 40 mg/L of methyl orange, it was observed that 85.7% of the methyl orange was degraded at an illumination time of 300 min. However, the degradation of rhodamine and methylene blue was not good and did not give better results as that of methyl orange. Wastewater from dye industry has been considered as an important source of water pollution in the world due to its highly colored nature and refraction to degradation. Research on photocatalyst carried out in 1970s was commenced by irradiation of TiO2 photo-electrodes under irradiation of UV light and resulted in the decomposition of water to form oxygen and hydrogen [1, 2, 3]. Choi et al. investigated the photo reactivity of 21 metal ions that were doped into TiO2. It was found that when the metal ions were doped, they expanded TiO2 photo response into visible spectrum. However, when metal ions are added into TiO2, impurity and lattice energy levels were formed in the gap of TiO2. As represented in Eqs. 1 and 2 below. where Mn+ & M are metal ion dopant and metal, respectively. The electron hole transfer between TiO2 and metal ion can alter the holes’ recombination as shown in Eqs. 3 and 4. Furthermore, a main drawback of any powder form is that either the process has to be conducted in a suspension or the photocatalyst has to be immobilized on a carrier by compacting . Mohsen et al. investigated in situ manganese doping of TiO2, single-step electrochemical anodizing titanium, such as Sulfur-dope TiO2, copper-decorated tungsten oxide-TiO2 nanotubes, iron-decorated tungsten-titania, tungsten-copper co-sensitized TiO2 nanotube composite photo anodes [5, 6, 7, 8]. Fe/WTNs photocatalytic activities were evaluated by degradation of aqueous Rhodamine B under xenon lamp radiation. It was discovered that the photocatalytic degradation reaction depends on many factors, such as the absorption of the dye on the catalyst surface, band gap energy, surface area, pore diameter, crystallinity, and electron–hole recombination rate [9, 10, 11, 12]. where M2+ represents the divalent cations such as Mg2+, Fe2+, Ni2+, Cu2+, Co2+, Mn2+, Zn2+ or Cd2+, M3+ denotes the trivalent cations like Al3+, Cr3+, Ga3+ or Fe3+, An−, is the compensating anions (CO32−, SO42−, Cl−, NO3−, organic anions), An− is an interlayer n− valent anion and x varies between approximately 0.25 and 0.33 and m is the content of co intercalated-water [13, 14]. In the process of photocatalysis and fabrication, LDH-based photocatalysts are generally subjected to a variety of synthesis methods. However, some major challenges include simplifying the synthesis process with high crystallinity, high dispersion and adequate exposure of the active sites, precise control of particle size and morphology and long-term catalytic stability are encountered . Various catalysts such as polyaniline Zr(IV) selenotungstophosphate nanocomposite (PANI/ZSWP nanocomposite) were prepared as a photocatalytic agent for dye degradation and as antimicrobial agent, such as the removal of harmful hazardous MB and MG dyes from water system and treatment of diseases causing pathogens . A family of visible light-responsive Ni–Zn/Cr–CO32− ternary LDHs was synthesized by a co-precipitation method with varying the Ni/Zn atomic ratio. The study suggested that properly incorporating transition metals into the brucite layer of LDHs with suitable band edges might be a promising alternative for developing visible light-responsive ternary systems for hydrogen evolution . Kulamani Parida et al. evaluated the photocatalytic activity via the photo-degradation of various colored and colorless pollutants under solar light, it was found that ZBHy4 LDH exhibited much higher photocatalytic activity than ZB4 LDH. The enhanced photocatalytic activity of ZBHy4 LDH is attributed to high crystallinity and phase purity, low recombination of charge carriers, long lifetime of photo-generated charges etc. . The thermal stability of Cu–Cr LDH increased by increasing Co amount in the brucite layer and photocatalyst exhibits high photocatalytic activity in the visible region due to the cooperative effect of binary cations and more electron-transfer capability of cobalt along with uniform pore size distribution . OG/La2O3/ZrO2 nanocomposite has been fabricated by co-precipitation method. OG sheets provided high surface area for the adsorption of dyes to take place and the deposition of other two metal oxides onto the OG helped in suppressing the electron–hole pair recombination ability thus, leading to high photocatalytic activity of OG/La2O3/ZrO2 towards the degradation of fast green dye . The photocatalytic activity of ChPA/ZS nanocomposite was measured by the photo-degradation of Congo red and methyl orange dyes under solar light radiations and the results indicated that chitosan-g-poly(acrylamide)/ZnS nanocomposite had an ability for dye removal under simultaneous adsorption and photo-degradation . A novel PAM/NZP nanocomposite has an efficient adsorbing power and visible light photo-activity. The utilization of photon energy from a wider spectrum of solar light, lower electron–hole recombination, and simultaneous adsorption leads to degradation of rhodamine B and malachite green . CeMoPO4 and GA/CeMoPO4 nanocomposites were investigated for their photocatalytic activity using methyl violet as test contaminate. The degradation results revealed that the GA/CeMoPO4 has better photocatalytic activity . 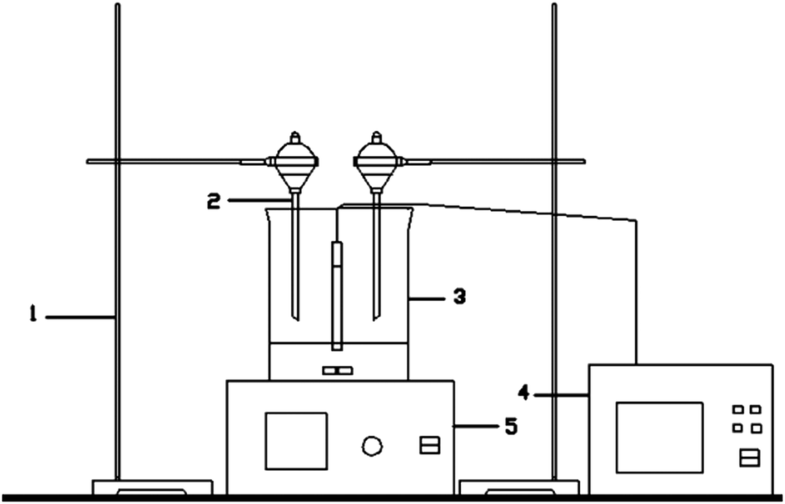 Many researchers have studied different synthesis methods through a lot of work on the preparation of LDHs, such as, ultra-sonication method , facile weight impregnation method  but mature synthesis methods include co-precipitation [26, 27], hydrothermal synthesis [28, 29, 30], microwave radiation, ion exchange chromatography, sol–gel method [31, 32], etc. 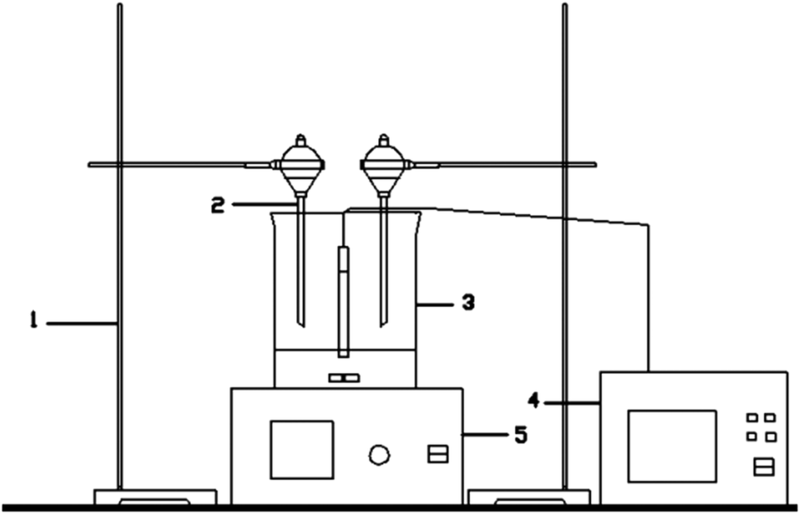 Co-precipitation method is the most basic and commonly used synthetic method of hydrotalcite. Co-precipitation method is done in two different forms: co-precipitation at variable pH and at constant pH. The co-precipitation at constant pH results in particles with greater uniformity . However, the structural environments and dynamical behavior of the interlayer and surface species of hydrotalcites are difficult to study and poorly understood. A number of papers dealing with systems containing one divalent and one trivalent cation exist. But only a few systems containing two divalent and one trivalent (Co–Mg–Al) cation have been reported [33, 34, 35]. Shekoohi et al. 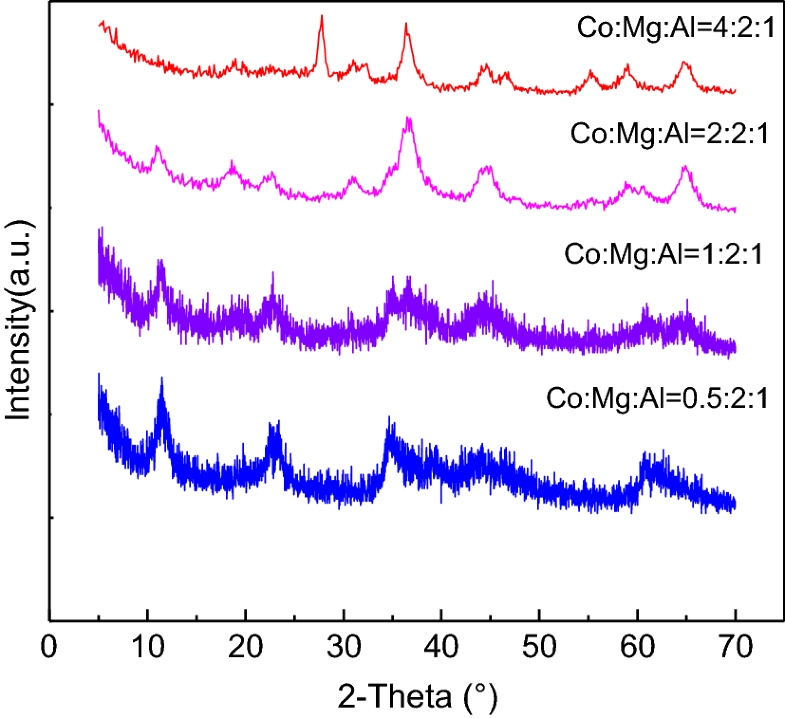 successfully prepared Co–Mg–Al Nano hydrotalcites, the crystallinity and crystallite size of the hydrotalcite were observed to vary with M2+/M3+ molar ratio. The increase of M2+/M3+ ratio causes changes in the layer spacing and particles sizes become larger. 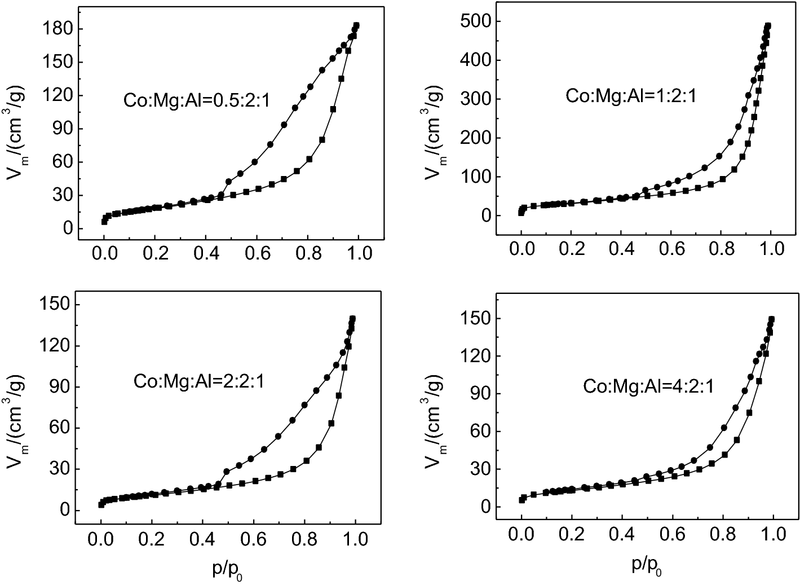 Co–Mg–Al nano hydrotalcites have larger particle size than Mg–Al nanohydrotalcites. 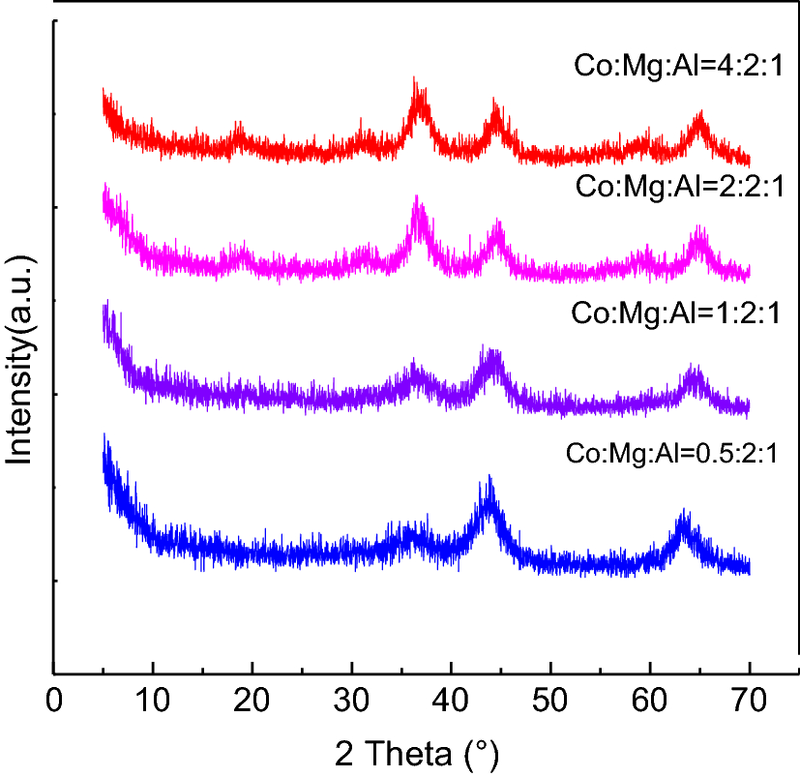 In this paper, ternary Hydrotalcite (Co–Mg–Al) with different Co molar ratio (4:2:1, 2:2:1,1:2:1, and 0.5:2:1) was prepared and the influence of Co molar ratio on the structure and performance of the prepared samples on degradation of methyl orange, rhodamine talcum and methylene blue was studied (Fig. 1). Methyl orange (di-methyl-amino azo-benzene sulfonate) belongs to the azo dyes with maximum absorption wavelength at 464 nm. Due to its high-Chroma, well-defined optical absorption characteristic, it can easily be absorbed onto catalyst from its aqueous solution, strong toxicity, and potential carcinogenic aromatic amine, which is listed as one of the most in urgent need of treatment in wastewater. 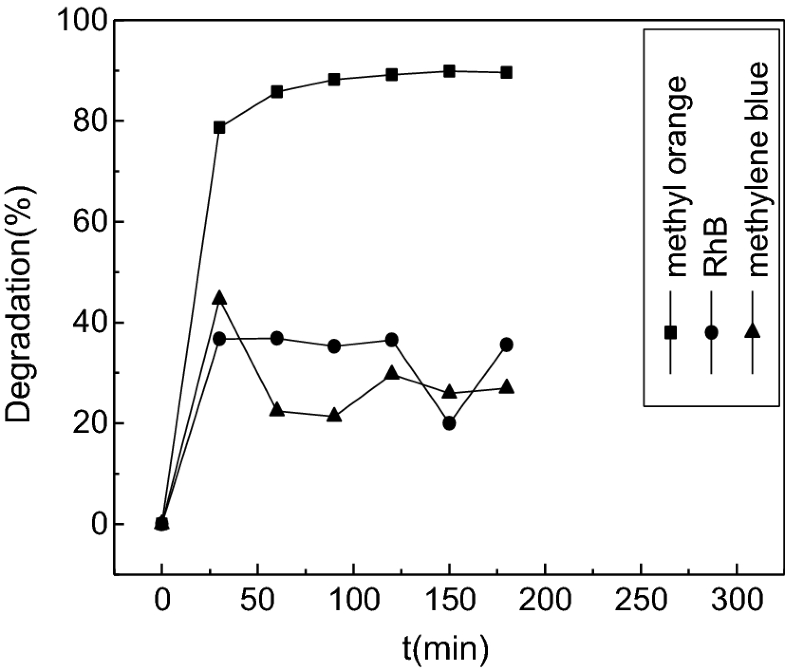 Thus, in this paper methyl orange was chosen as the processing object, the photocatalytic activity of the sample catalysts on methyl orange was compared with those on both rhodamine talcum and methylene blue (Fig. 2). Sodium hydroxide solution was added into a salt solution prepared by dissolving Al (NO3)3·9H2O, 6H2O, Mg (NO3)2·6H2 and Co(NO3)2 in water at Co/Mg/Al molar ratio of 4:2:1. 2:2:1, 1:2:1, 0.5:2:1. The change in the pH value versus NaOH was obtained by adding a known volume of NaOH and the resulting curve (Fig. 3) displayed an optimum pH value of 9–10. CoMgAl-LDHs were then prepared by co-precipitation method at constant pH of 9–10. 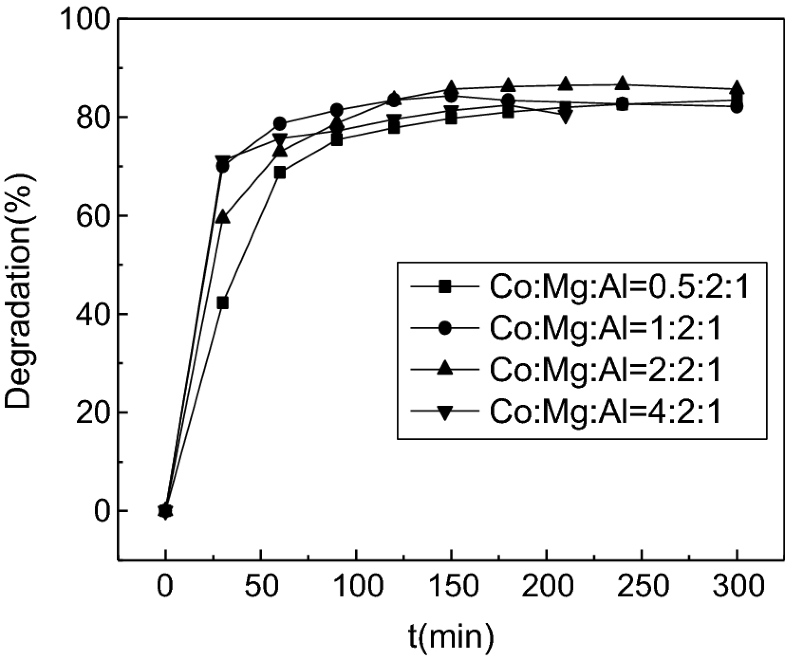 The Co/Mg/Al salt solutions with molar ratios of 4:2:1, 2:2:1,1:2:1, and 0.5:2:1 were prepared from Al(NO3)3·9H2O, Mg(NO3)2·6H2O, and Co(NO3)2·6H2O. The prepared Co/Mg/Al-LDHs salt solutions and the prepared basic solution containing NaOH and Na2CO whose molar ratio was 1:0.5 were added slowly into 100 mL deionized water. The mixture was continuously stirred and the pH was kept at 9.3. A gel-like precipitate was obtained. The gel was then placed in a water bath at 60 °C and the mixture was vigorously stirred. The slurry obtained was then repeatedly washed with deionized water until the pH reached 7. The precipitate was then filtered and dried at 80 °C for 24 h. The solid obtained was ground to about 60–80 mesh. The resulting samples were labeled as CoMgAl-LDHs. These samples were calcined in the furnace to about 400 °C for 8 h, resulting into composite oxides. All the reagents used are of analytical standard. Shimadzu UV-2550 (UV–visible spectrometer) equipped with small sphere diffuse reflectance accessory and BaSO4 reference standard scan of range 200–800 nm was used. Adsorption–desorption analysis of pore size distribution was conducted using Gold Egyptian Spectrum Technology V-sorb 2800p. BJH method was used and BET equation obtained before the adsorption of the isotherm was calculated. This was conducted using the HCT-I analyzer to qualitatively analyze the decomposition process of water. And then hydrotalcite structure was analyzed at a temperature range of about 10–800 °C. This is one of the most widely used electron microscopes to observe surface morphology such as, the particle dispersion, the grain size, and shape of catalysts. JSM-6360LV model microscope was used. The experiment was carried out in a photocatalytic reactor. A 500 w xenon lamp of wavelength λ > 400 nm was used as a source of light to simulate the visible light. The length of the lamp used was 6 cm and a light intensity of 1.5 KW/m2. where D refers to the degradation of the dye. A0 and At are the absorption at the initial and time t, respectively. From Fig. 3, it can be seen that there are 3 distinct peaks: pH = 12–13, pH = 6–8 and pH = 3–5. Comparing the 4 images, it was found that with different Co/Mg molar ratio, the peak range was slightly different. It is clear that the choice of synthesis optimal pH ranges from 9–10. The figures show pH value change curves of CoMgAl-LDHs = 4:2:1, 2:2:1, 1:2:1 and 0.5:2:1 against sodium hydroxide solution. Figure 4 shows diffraction pattern of CoMgAl-LDHs. The difference in the intensities of the reflections indicates different degrees of crystallinity . With increase of the second divalent cation (Co2+) in hydrotalcite, the XRD peak at 11o(d(003)) becomes broader with increasing moles of Co, indicating a more disordered structure or a decrease in crystallinity . The peak at about 11° 2-teta for all sample of hydrotalcite are attributed to the reflections from (003) of crystallographic planes. The a and c values of each sample cell can be calculated based on the numerical value of the diffraction and the d value . The parameter a of hydrotalcite be calculated by a = 2 × d110. On the other hand, the c parameter can be obtained from c = 3 × d003. The Fig. 5 shows the XRD pattern of CoMgAl-LDO after calcination at 400 °C for 8 h. From the XRD pattern, the peaks at 37°, 44°, and 64° are the characteristics diffraction peaks of hydrotalcite structure, the samples prepared by baking at 400 °C generated composite oxides. The Fig. 6 shows the XRD pattern of calcined CoMgAl-LDHs after methyl orange adsorption. The patterns at 11°, 23°, 34°, 39°, 46°, 60°, and 62° are the characteristics diffraction peaks of hydrotalcite structure. This indicates that the calcined samples have absorbed methyl orange to saturation. Thus, the hydrotalcite structure has been restored, an evidence of “memory effect” . The Fig. 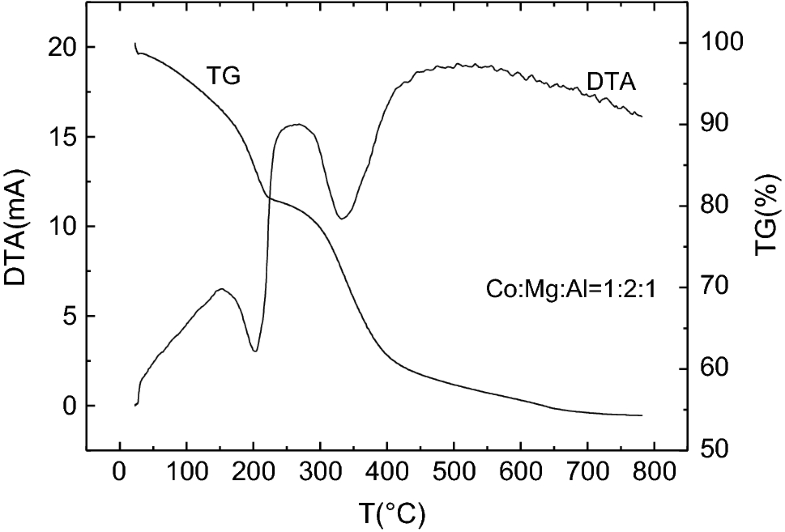 7 represents CoMgAl-LDHs (Co/Mg/Al = 1:2:1) differential thermal gravimetric analysis. The downward peak is an endothermic corresponds to the physical removal of adsorbed water below 100 °C. Above 100 °C, there are two distinct weight losses. The first phase exhibits endothermic peak corresponds to the interlayer water molecule removal. 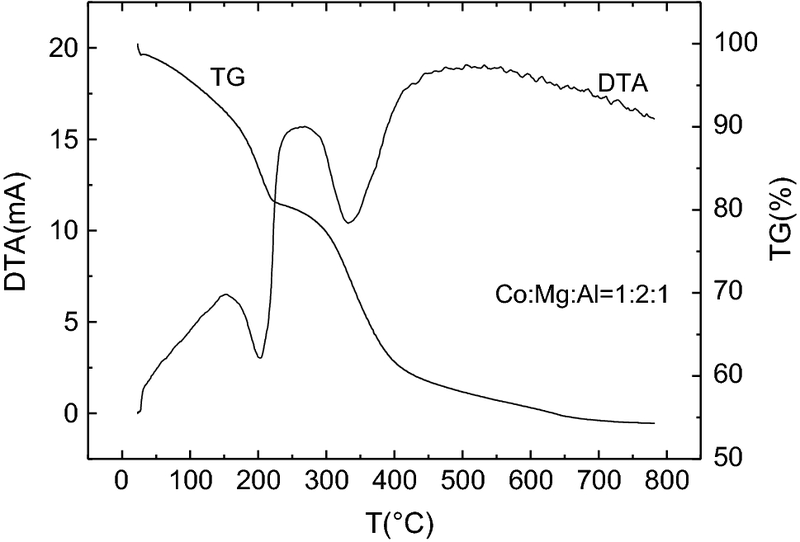 The second phase exhibits an endothermic peak corresponds to dehydroxylation and decarbonation of the layer .With the addition of the second divalent cation (Co) in the brucite-like structure, Co–Mg–Al-hydrotalcite exhibits lower thermal stability. Table 1 below shows the data for the corresponding thermal decomposition data. 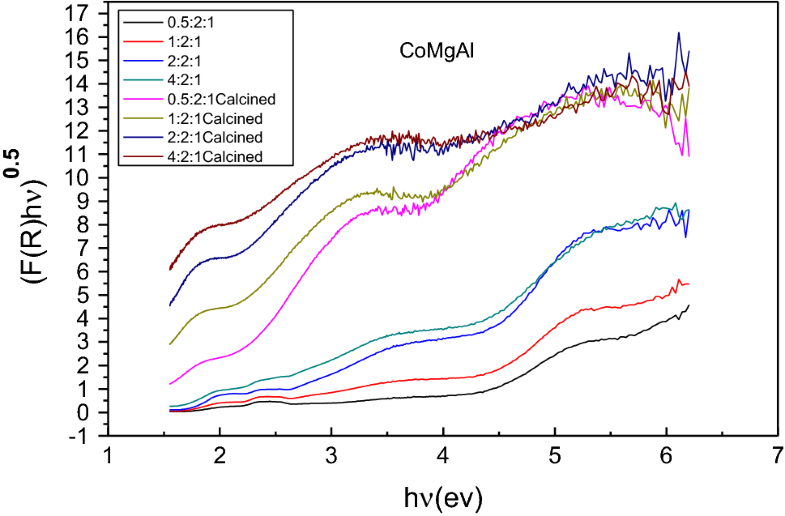 Figure 8 shows the UV–visible diffuse reflectance spectra of Co:Mg:Al (= 4:2:1, 2:2:1, 1:2:1 and 0.5:2:1). The results from the spectrum show that, except at 400 or less, CoMgAl-LDHs show a stronger absorption of ultraviolet light. There is also obvious absorption peak at a wavelength of 520 nm in the visible region. Co:Mg:Al = 4:2:1 and Co:Mg:Al = 2:2:1 samples showed a tiny absorption peak at a wavelength of 640 nm (Table 2). It is clear that CoMgAl-LDHs showed visible light absorption features. It can be seen that an increase in Co content in the samples causes an increase in light absorption ability both in the visible and ultraviolet region along with obvious red shift . Figure 9 shows the UV–visible diffuse reflectance absorption spectra, hν on the horizontal axis while Co:Mg:Al (= 0.5: 2:1, 1:2:1, 2:2:1, and 4:2:1) on the vertical axis. where R = relatively diffuse reflectance, h, the Planck’s constant = 6.62176 × 10−34 J s, c, speed of light = 3 × 108 m/s. Absorption limit λ0 made by the absorption edge tangent to determine the intersection of the horizontal axis. 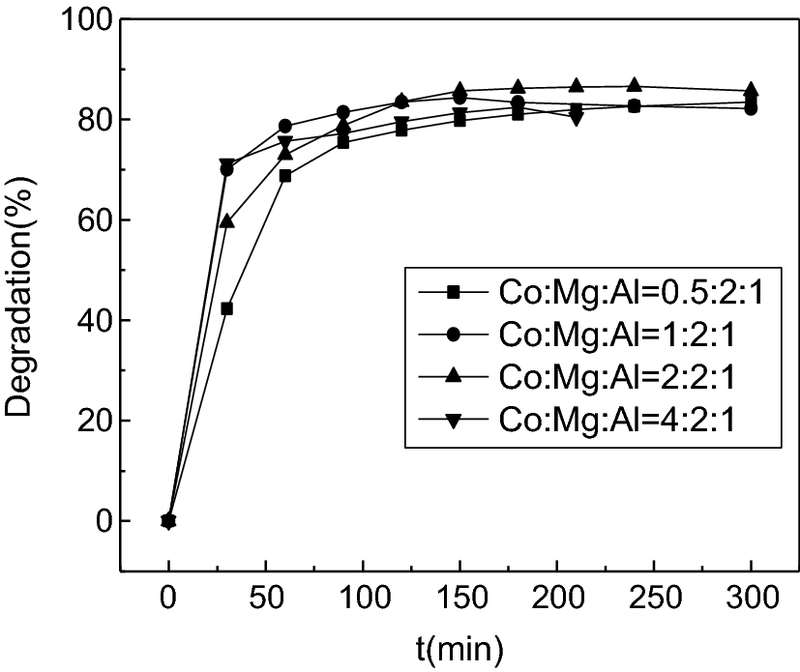 They were done in tangent of Co:Mg:Al = 0.5:2:1, Co:Mg:Al = 1:2:1, Co:Mg:Al = 2:2:1 and Co:Mg:Al = 4:2:1, λ0 was calculated according to the band gap formula corresponding to listed in Table 3. The narrow the band gap the higher the utilization rate of visible light by the sample. The morphologies of these samples are shown in Fig. 10. As seen in the images after adsorption treatment, the CoMgAl-LDHs formed lamellar structure, the sheet of layers stacked to one another but evenly distributed. However, Co:Mg:Al = 2:2:1 exhibited low accumulation level. Furthermore, it can be seen that there was an increase in the aggregation degree in Co:Mg:Al = 4:2:1 but there wasn’t obvious lamellar structure. When the Co content was increased, the sheets became irregular; it was difficult to observe the lamellar morphology . From the images after they had been calcined at 400 °C, the LDHs layer could not be observed. The hydrotalcites’ layered structure in LDHs was restored after being treated and roasted. This clearly indicates “memory effect” existence [5, 10, 24]. Figure 11 shows N2 adsorption–desorption isotherm of CoMgAl-LDHs. 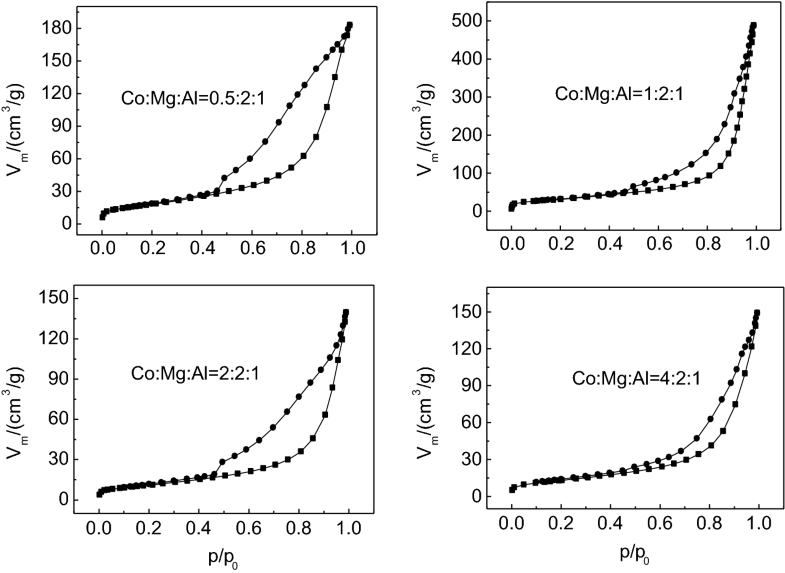 The Table 3 shows N2 physical adsorption data of Co:Mg:Al = 0.5:2:1, Co:Mg:Al = 1:2:1, Co:Mg:Al = 2:2:1 and Co:Mg:Al = 4:2:1. It can be seen from the Table 3 that, Co:Mg:Al = 1:2:1 possessed larger specific surface area. In the experimental process, aqueous solution of methyl orange (azo dye) was used as the processing object on the photocatalytic degradation study. The methyl orange azo structure is shown in the Fig. 12. Hydrotalcite has unique layered structure and strong adsorption. Before carrying out the photocatalytic degradation process, adsorption to saturation after the calcination of the CoMgAl-LDHs was conducted. 1 g/L catalyst and 40 mg/L of methyl orange solution were used. 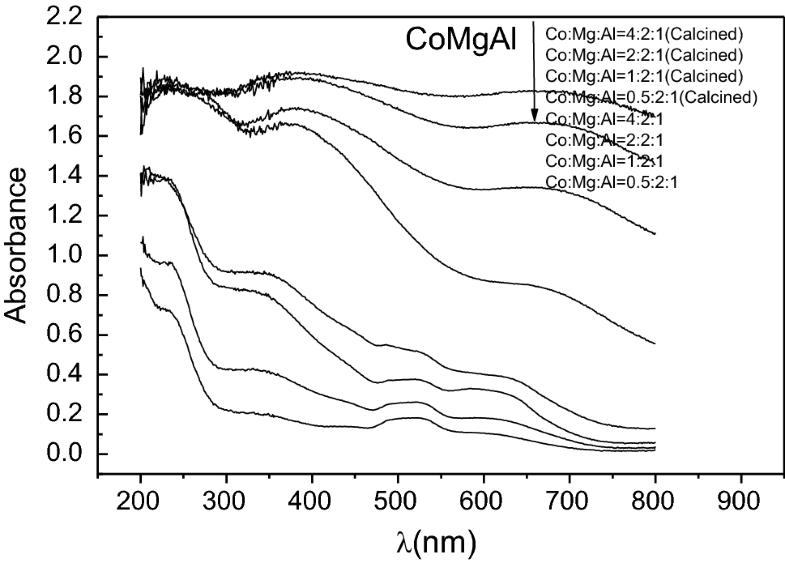 The result of methyl orange visible light photocatalytic degradation with different molar ratio of Co/Mg/Al in CoMgAl-LDHs is shown in Fig. 11. Furthermore, a comparative photo-degradation of various dyes (rhodamine and methylene blue) in addition to methyl orange over the most active (LDH-Co/Mg = 1:2) was carried out to access the future photocatalytic application of this catalyst (Fig. 14). Figure 14 below shows degradation rate of rhodamine, methylene blue and methyl orange, respectively. 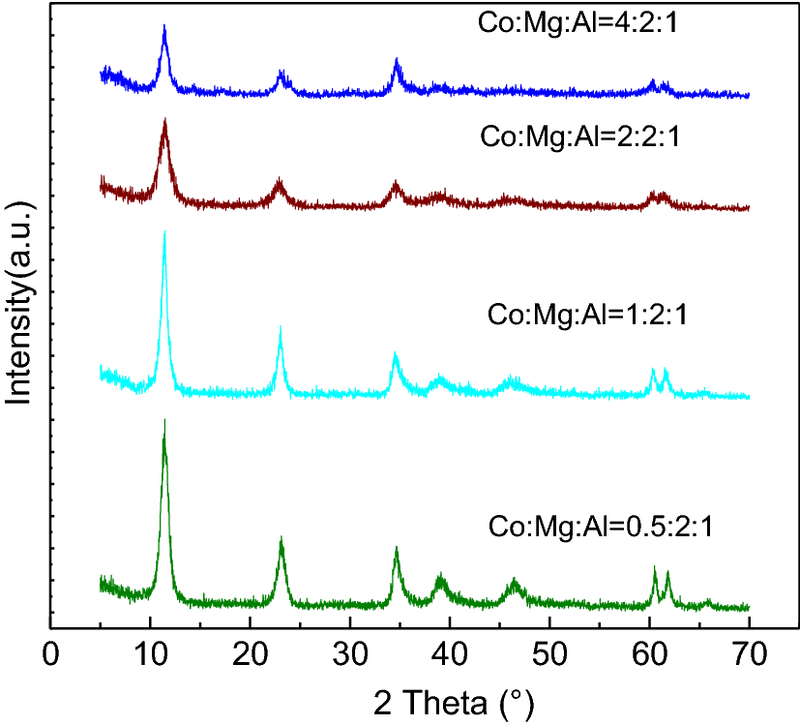 Co:Mg:Al = 1:2:1 catalyst (1 g/L hydrotalcite precursors) was selected. 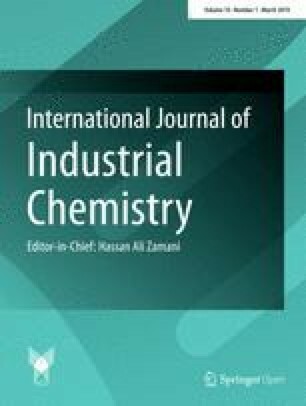 It was observed from the curves that, the photocatalytic effect of the catalyst on the degradation rate for methyl orange was more significant as compared with the effect on rhodamine talcum and methylene blue. In this work, CoMgAl-LDHs were successfully prepared by co-precipitation method and various techniques such as UV–vis, BET, TG–DTA, SEM analysis, and XRD were used to investigate the catalytic activity, structure and composition of the prepared samples. 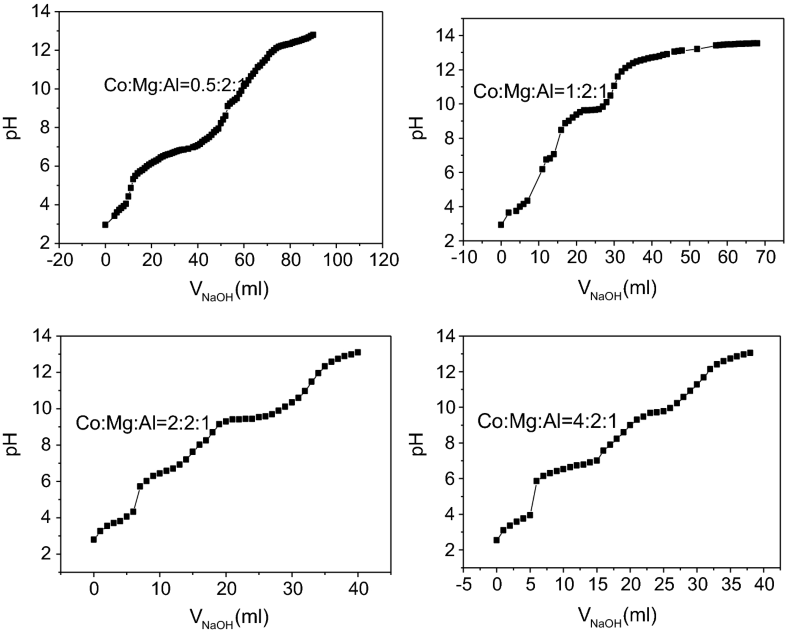 The crystallinity of the CoMgAl-LDHs was observed to vary with Co molar ratio. Morphological analysis, by SEM method, revealed the formation of layered double hydroxides crystals and their cohesion result in different particle sizes. However, when the LDHs were calcined at 400 °C, the structure is destroyed, but some of its layered structure was restored after adsorption to saturation process. According to BET results, Co–Mg–Al (1:2:1) have largest surface area compared with other samples. 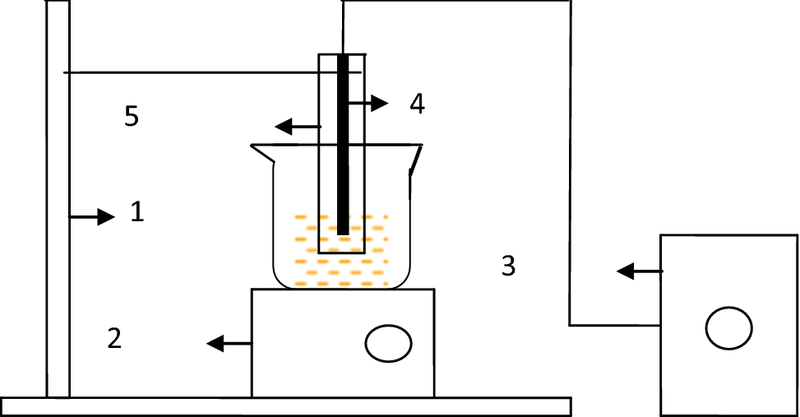 The photocatalytic activity results showed that, CoMgAl-LDHs exhibited good ability to degrade methyl orange under visible light. The degradation methyl orange reached 85.7%. However, CoMgAl-LDHs degradation of methylene blue and rhodamine was not as good as that of methyl orange. The authors are grateful to China National Natural Science Foundation (No. 51374066, 51304047), the National Key Technology R&D Program (No. 2014BAC03B07), and Industrial Research Projects, Liaoning Province (No. 2012223002, 2014020037) for the financial support in ensuring successful completion of this project.